Redmi is a Xiaomi line of budget devices, and it’s logical that gadgets from this series have become popular. The Chinese company Xiaomi is one of the few that offers quite high-quality and productive cheap mobile phones. As soon as the Redmi 3 model appeared on the market with a good hardware, very powerful battery, and even at an affordable price, it immediately made a splash! Xiaomi decided to consolidate this success and created some modifications of this model – 3S, 3X, 3 Pro. There are differences between them! All phones in this series are made of magnesium alloy. There is different design, but not a big. In particular, the simplest modification – Redmi 3 – has a pattern, the rest without a pattern, but with a fingerprint scanner on the rear panel. As for color variations, all models are available in silver, gray and gold colors. One of the main differences between all the gadgets of this series is hardware. Redmi 3S and 3X – with the Snapdragon 430 with Adreno 505 graphics. It’s easy to assume that Redmi 3 and 3 Pro are more powerful, because these phones uses Snapdragon 616 processor. But Snapdragon 430 chip is newer (although class is lower), and at the same time it has the best graphics core Adreno 505, which also gives an increase in performance. However, the difference in this parameter will be insignificant and it will be difficult to determine by eye. 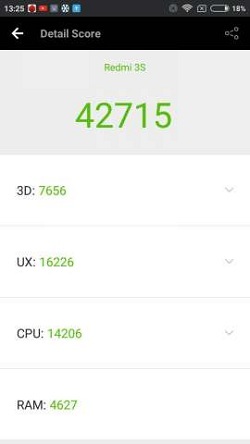 Xiaomi Redmi 3 with 8-core chip Qualcomm Snapdragon 616 (4×1.5 GHz, 4×1.2 GHz) and 2 GB of RAM gave the result 34437 points in the program Antutu. Redmi 3S with a chip Snapdragon 430 (4×1.1GHz, 4×1.4 GHz), Adreno 505 graphics and 2 Gb of RAM scored 42715 points in the same program. 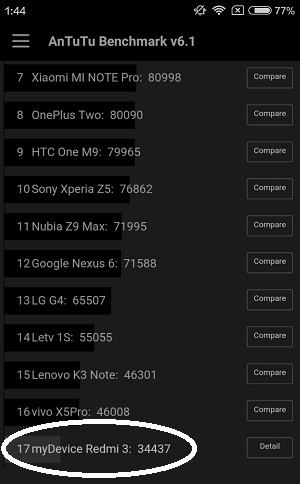 As you can see, despite the lower processor class, the Redmi 3S scored more points. And in general, among the representatives of the Redmi 3 line, 3S is the most powerful. The gadget even called the most productive budget smartphone in 2016. At the beginning of 2017, device didn’t lose this status. By the way, Redmi 3X is also equipped with a Snapdragon 430 processor, but previously it was positioned as a smartphone for the Chinese market. But at the same time, it supports the same set of networks as the 3S model. 3X – 2 GB of RAM, 32 GB. This is the difference between the Xiaomi phones of Redmi 3 branch. The rest specs remain unchanged, but we will also name them. Sim cards – all modifications support Micro-sim, nano-sim (can be combined with a slot for microSD memory card). Cameras – rear 13 megapixel with f/2.0 diaphragm, ISOCELL sensor, LED flash. The front camera is simple – with a f/2.0 diaphragm and a classic 5 MP resolution. Mobile networks: GSM (850, 900, 1800, 1900 MHz), LTE (1800, 2100, 2600 MHz), LTE-TDD (B39, B40, B41, B38), CDMA (800 MHz), UMTS (850, 900, 1900, 2100 MHz). The conclusion suggests itself. The best among the existing models of Redmi 3 is 3S. This model is newer, equipped with the best processor (although lower in class) with a good video chip, is recognized as the best phone among modern budget smartphones.